Nikon to replace J1 this month? Is the J1 due for replacement soon? Online suggestions that Nikon will be upgrading its mirrorless camera line have started to appear. 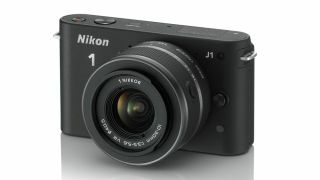 The Nikon 1 J1 was introduced to the market almost a year ago in September 2011, and at various points throughout its life it has been the number one selling compact system camera on the market. For the moment, there are very few details known about what may be called the Nikon 1 J2 or Nikon J2 for short, but it seems likely that Nikon will be keen to respond to the Canon EOS M, which was announced last month. It's also been reported that new mirrorless camera accessories, including an underwater housing will be announced in the middle of August. Some of the concept lenses shown by the company over the past 12 months are also expected to come to fruition. Whether a Nikon 1 V1 replacement will also appear is not known, but as this hasn't had the same success as the J1, it may be that Nikon decides not to pursue that line. Others have made suggestions that a "pro" Nikon 1 body will be making its debut at Photokina. Canon's M camera uses a large APS-C size sensor in a body which is roughly the same size as the J1, which uses a one-inch device.